Constructed out of Aqualon fabric, a marine grade acrylic coated polyester, which provides durability and superior strength. Highly water repellent, mildew and ultraviolet resistant. Thermal insulated with bonded dacron fiber for an R-13 value. Secured in place with #2 brass spur grommets, zip ties included. Your devices length should measure 5" - 7" smaller than the finish cover size to provide a proper fit. 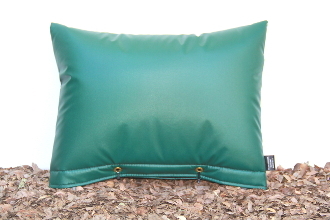 Product shown in Forest Green, also available in Mountain Rock Beige.